A Missa Cantata with choir will be offered November 1 at the Traditional Latin Mass Congregation of Silver Spring, Maryland. Father Vincent Rigdon, pastor of Our Lady of the Presentation parish in Poolesville, will be the celebrant of the Mass of the Feast of All Saints. Holy Mass will begin at 10:30 am. Confessions will be heard from 10:00 to 10:25 am. In an email note from a kind reader, we are informed that Monsignor Arthur Bastress, 87, pastor of St. Alphonsus Church in Baltimore, has been a patient at Baltimore’s Mercy Hospital since Sunday afternoon suffering from infections in his left wrist and elbow, which may require surgery. We ask that, in your charity, you pray for Msgr. Bastress’ full recovery to health of body and soul. There will be no Friday Traditional Latin Mass at St. Alphonsus on October 31. Traditional Masses for the November feasts and the 21st Sunday of Pentecost will be offered as scheduled, including an All Souls’ Day Mass at 7:00 pm. Readers are advised to phone the parish office at 410-685-6090 for information about future Masses; information received at our website will be passed along as it becomes available. The following is a verbatim transcription, slightly abridged, of a post from the blog of Monsignor Charles Pope of the Archdiocese of Washington. Because that website has been inaccessible for some hours, we reproduce the post here. If the ladies will pardon me (for women have their own sort of strength), I want to issue a special summons to men, especially fathers, husbands, and priests. The summons is simple: be a man. We need men in these dark days, men who will heroically speak and act, men who will announce the truth and insist upon it wherever they have authority, men who will stop being passive fathers and husbands, priests who will stop “playing it safe” by remaining silent in the moral storm. Yes, be a man. It has often been observed that men are rather disengaged from the practice of the faith and attendance at the Sacred Liturgy. Frankly, there is a reason—not a politically correct one, but a reason nonetheless. Most of the men I talk to find the Church rather feminized. There is much talk about forgiveness and love, about receptivity and about being “nicer.” These are fine virtues, all of them necessary. But men also want to be engaged, to be sent into battle, to go forth and make a difference. Not a bad summons to heroic and public witness to the faith! Not a bad summons to manly virtues like sacrifice, strength, insisting on what is right, meeting perils toe-to-toe, courage, speaking out, self-control, and so forth. The Church used to speak more often in this way. Today there seems to be only the goal of not hurting or offending anyone. You see, the Lord is looking for a few good men. Are you a Christian man? Have you reached spiritual manhood? This is not the kind of manhood that comes merely with age. It comes when we pray, hear, and heed Scripture and the teachings of the Church. It comes when we live the faith courageously and summon others to follow Jesus without compromise. It comes when we speak the truth in love and live out the truth. It comes when we fear God and thus fear no man, for when we are able to kneel before God we can stand before any human threat. . . . Here are a few good websites for Catholic Men . . .
Mass will be offered for the Feast of All Saints on Saturday, November 1, at 8:00 am. On Monday, November 3, the transferred commemoration of All Souls will be observed with a Mass at noon. A First Friday Mass will be celebrated at 7:00 pm on November 7. Eucharistic Adoration will follow immediately after Mass. The Traditional Latin Mass (Extraordinary Form) will be offered on Wednesday and Saturday of this week by Father Richard Carr at St. Michael Church, 7401 St. Michael’s Lane, Annandale. On Wednesday, October 29, a Requiem Mass will be offered at 7:15 am. 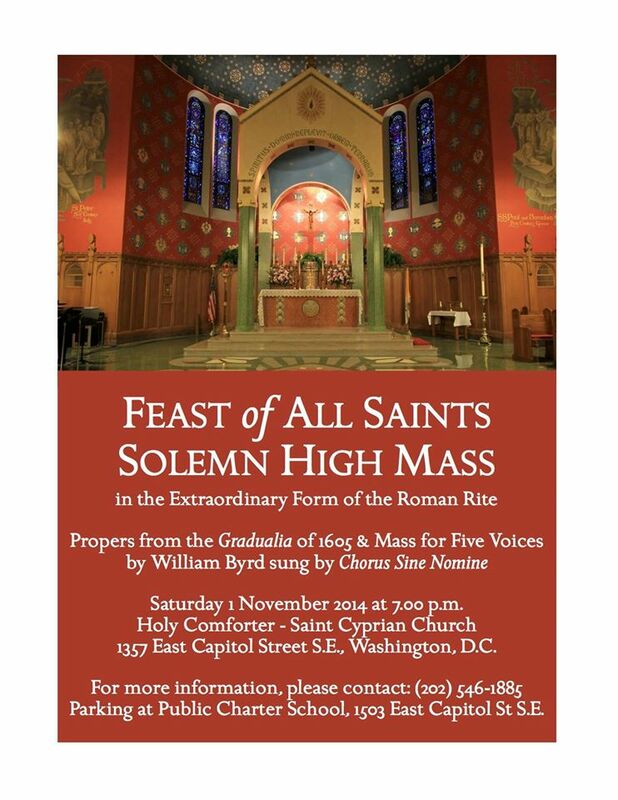 On Saturday, November 1, Missa Cantata of All Saints will be offered at 11:00 am. The Georgetown Traditional Latin Mass (Extraordinary Form) Community announces that a Missa Cantata will be offered Friday, October 31, at 6:00 pm in Copley Crypt Chapel at Georgetown University. Father Stephen Fields, S.J., will be the celebrant of the Mass of the Friday of the 20th Week after the Octave of Pentecost. Following Mass, a relic of St. John Vianney will be made available for veneration. A Missa Cantata with schola will be offered Sunday, October 26, at the Traditional Latin Mass Congregation of Silver Spring, Maryland. Father Jacob Straub of the Diocese of Covington, Kentucky, will be the celebrant of the Mass of the Feast of Christ the King. On Saturday morning, October 25, at 7:00 am, the Traditional Latin Mass (Extraordinary Form) will be offered by Father Richard Carr at St. Michael Church, 7401 St. Michael’s Lane, Annandale. The Feast of Saints Chrysanthus and Daria, Martyrs, will be celebrated. A Low Mass will be offered October 19 at the Traditional Latin Mass Congregation of Silver Spring, Maryland. The celebrant of the Mass of the 19th Sunday after Pentecost will be Father Shawn Tunink of the Archdiocese of Kansas City, Missouri.